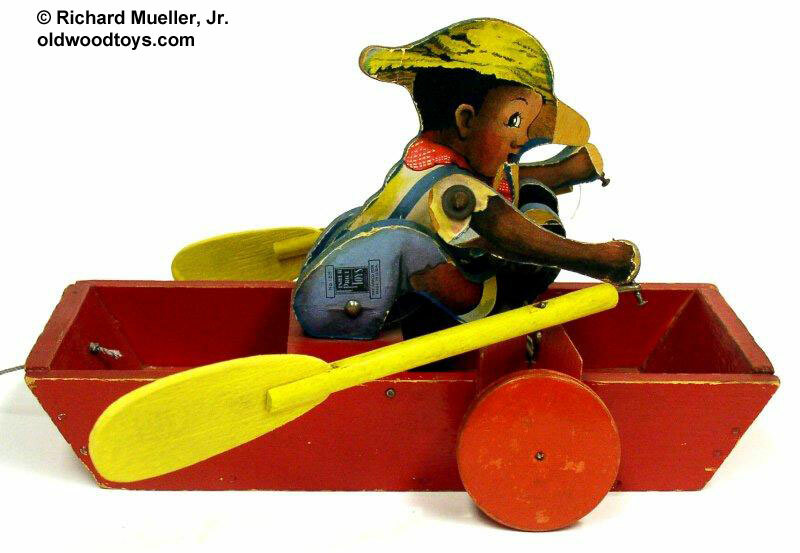 Description: Skipper Sam is an African-American boy riding in his own wooden boat. Sam has his hands firmly placed on two boat oars ready to sail down a river. When pulled, Sam bends forward then leans back pulling the oars forward in a realistic rowing action. So much rowing is a lot of hard work causing Sam to grunt (concealed voice) as he rows. FPT4070 - Skipper Sam - Wooden African-American boy with four-color lithography on his body, arms, and legs. Sam is wearing blue overalls, a white short-sleeve shirt, a red scarf around his neck, and a yellow straw hat. Sam sits in a red wooden row boat and rows with 2 yellow wooden oars as toy is pulled. Measures 7-3/8" high, 10-3/4" long, 6" wide. Each oar measures 7-1/2" long. Original retail price was $1.00. 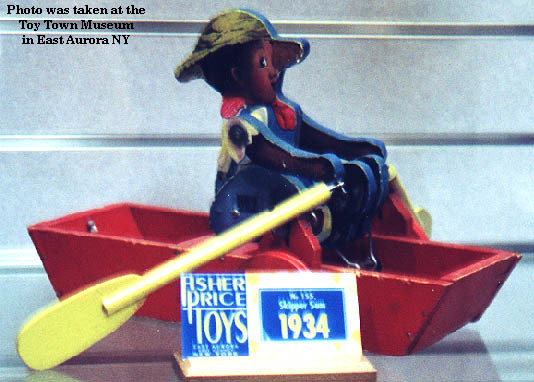 This was Fisher-Price's first African-American pull toy.